Cryogens are effective thermal storage media which, when used for automotive purposes, offer significant advantages over current and proposed electrochemical battery technologies, both in performance and economy. An automotive propulsion concept is presented which utilizes liquid nitrogen as the working fluid for an open Rankine cycle. The principle of operation is like that of a steam engine, except there is no combustion involved. Liquid nitrogen is pressurized and then vaporized in a heat ex-changer by the ambient temperature of the surrounding air. The resulting high – pressure nitrogen gas is fed to the engine converting pressure into mechanical power. The only exhaust is nitrogen. The usage of cryogenic fuels has significant advantage over other fuel. Also, factors such as production and storage of nitrogen and pollutants in the exhaust give advantage for the cryogenic fuels. The importance of cars in the present world is increasing day by day. There are various factors that influence the choice of the car. These include performance, fuel, pollution etc. As the prices for fuels are increasing and the availability is decreasing we have to go for alternative choice. Here an automotive propulsion concept is presented which utilizes liquid nitrogen as the working fluid for an open Rankine cycle. When the only heat input to the engine is supplied by ambient heat exchangers, an automobile can readily be propelled while satisfying stringent tailpipe emission standards. Nitrogen propulsive systems can provide automotive ranges of nearly 400 kilometers in the zero emission modes, with lower operating costs than those of the electric vehicles currently being considered for mass production. In geographical regions that allow ultra low emission vehicles, the range and performance of the liquid nitrogen automobile can be significantly extended by the addition of a small efficient burner. Some of the advantages of a transportation infrastructure based on liquid nitrogen are that recharging the energy storage system only requires minutes and there are minimal environmental hazards associated with the manufacture and utilization of the cryogenic “fuel”. The basic idea of nitrogen propulsion system is to utilize the atmosphere as the heat source. This is in contrast to the typical heat engine where the atmosphere is used as the heat sink. Liquid nitrogen is generated by cryogenic or Sterling engine coolers that liquefy the main component of air, nitrogen (N2). The cooler can be powered by electricity or through direct mechanical work from hydro or wind turbines. Liquid nitrogen consumption is in essence production in reverse. The Sterling engine or cryogenic heat engine offers a way to power vehicles and a means to generate electricity. Liquid nitrogen can also serve as a direct coolant for refrigerators, electrical equipment and air conditioning units. The consumption of liquid nitrogen is in effect boiling and returning the nitrogen to the atmosphere. 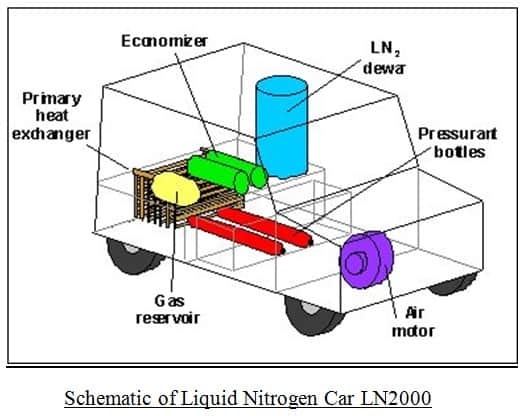 • Much like electrical vehicles, liquid nitrogen vehicles would ultimately be powered through the electrical grid. Which makes it easier to focus on reducing pollution from one source, as opposed to the millions of vehicles on the road? • Transportation of the fuel would not be required due to drawing power off the electrical grid. This presents significant cost benefits. Pollution created during fuel transportation would be eliminated. • Liquid nitrogen tanks can be disposed of or recycled with less pollution than batteries. • Liquid nitrogen vehicles are unconstrained by the degradation problems associated with current battery systems. • The tank may be able to be refilled more often and in less time than batteries can be recharged, with re-fueling rates comparable to liquid fuels. • The principal disadvantage is the inefficient use of primary energy. Energy is used to liquify nitrogen, which in turn provides the energy to run the motor. Any conversion of energy between forms results in loss. For liquid nitrogen cars, energy is lost when electrical energy is converted to liquid nitrogen. • Liquid nitrogen is not yet available in public refueling stations.